Over the years we have seen our competition lower their price over and over and over again. At what point does that not only negate the value of the product, but the industry? How do we respond, by lowering our price? No, we continue delivering first in class products at a great price. I recently had a colleague doing a bridal show and in a last ditch effort, the competition at the show crossed out and changed their prices with a sharpie. Yes, I’m not kidding, they took a sharpie and scribbled out the price and changed it to be lower. To me, that is a sign of desperation and poor business. I understand that clients go to bridal and event shows to get a good deal, but at what cost? If the vendor is resorting to undercutting the competition the day of, what else will they do? Don’t leave it to chance! You may ask why I even made a post about this. Simple, we sell customer service and along with that we deliver amazing products and great prices. Are we the cheapest on the block, no. Are we the most expensive, no. 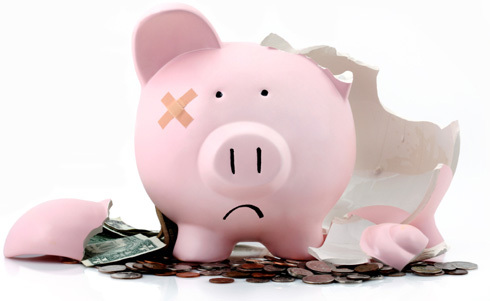 Let me ask you this… When you are in the process of planning an event, is your goal to save $1? What are you sacrificing by saving $1? 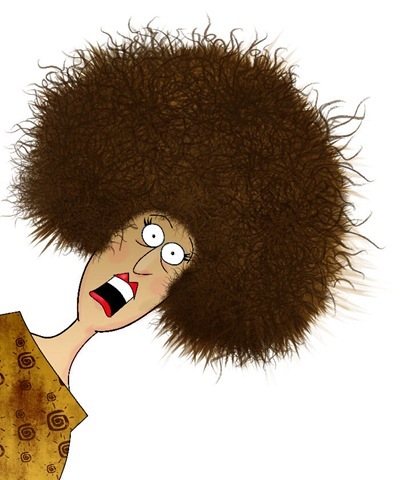 You are probably sacrificing customer service, product quality and cleanliness as well as a litany of headaches. As we all know, there are costs to running a business. Especially costs associated with doing it correctly. We have proven time and time again that we can save our clients money, but they are not sacrificing anything for that. Statistically, 86% of buyers justify paying more for a great customer experience. We treat all of our clients the same way, with respect. So as you venture out to plan your event, take everything into consideration and not just the price. Here are just a few things to be on the lookout for. Will the vendor give you the time you need to meet with them? These decisions are important and cannot be made in a rush. If the vendor is rushing you out the door, you might not be that important to them. Will the vendor meet with you a second time if needed? Some only give you 30-60 minutes and that’s it. Are you getting quick responses to your calls and emails? While we are not just waiting around for your call, we understand that your time is just as important as our time. You will always get a call or email back from us the same day, typically within the hour. Will the vendor give you a quote in writing to take with you? Yes, i know that there are people that shop around and that’s OK.
We want to allow you to compare apples to apples. Not having a quote might lead to comparing apples to hammers. Many won’t give you a written quote as they believe you will take that to their competitors for a better deal. We have no problem emailing you or printing your proposal right in our showroom. We will not give you something that is handwritten and clear as mud. We know our clients will use us for the quality of service we provide, even if it is a little more money. Is the vendor flexible with your counts? Most vendors have a hard line with a 10% adjustment with no flexibility at all. Our contracts state that you can adjust 10% up or down, but we are flexible. We know that you may have anticipated 200 people and your final counts came in at 170. We are not going to charge you for 10 people that were not coming. Most will and they don’t care. They will tell you that you signed a contract and that’s that. Now, if you reserved an event for 200 people and came back with only needing for 100, then we need to discuss it. We may have been able to reserve some of those items that were placed on hold for your event. Will the vendor be flexible the day of the event? We know the day of your event you have a lot going on and no time to deal with things that are completely out of your control. We understand that some events run over a little bit, maybe 30 minutes. So our staff will gladly wait outside the room until the party ends. I have heard of vendors charging their clients more money the night of because their staff had to wait more than 15 minutes. Granted, there is a reasonable amount of time that should be understood. But 15 minutes? To me, that is someone out to nickle and dime you all the way. Remember when I asked what you are sacrificing by saving $1? This is it! When the time comes to return your order (If it was not installed or torn down by the vendor), will you have problems? All of our contracts state that the rentals have to be returned the Monday following the event. If they were shipped to the location, they need to be shipped back the Monday following the event. Things happen and this does not always happen the way we plan. There are some weeks that things do not get returned until Tuesday. Could we charge for a late return, yes. Would we charge for a late return, no! I have heard horror stories from clients telling me that they did not get their items returned by an exact time and got charged a ridiculous amount because of it. This tells the client that they are not important to you, just a means of payment. This is another example of what happens when you try to save $1. To sum it all up, just do your homework and take advice from someone who has been in the event business for over 30 years. When you are planning that 200 person event and you can save $200 for something cheaper, does it make sense? In the grand scheme of the event and all the costs involved, go with the company that is going to provide you with the customer service you deserve! This past weekend we did the production for Jack’s Late Night Bar Mitzvah celebration at The Crofoot Ballroom in Pontiac, Michigan. This party was just awesome from beginning to end. It all started 5 months ago when I received a call from Paula Harris inquiring about some assistance with her son’s Bar Mitzvah on March 12, 2016. I met with Paula and John at the venue to discuss Jack’s party. During our first meeting, we had a blank slate to work with. Paula and John shared with me a little bit about Jack and what they were thinking. Along with a few photos from Paula, I came up with a plan. Rather than an actual theme, we built around the mood of the event. We decided on a UV/Black light party. Even though the venue hosts many concerts and has a ton of lighting, they had no UV lighting. In addition to that, I spoke to multiple people who had attempted a black-light party before and did not have much success. Paula had seen some pictures of an event that had slinkies hanging from the ceiling and I knew I could do it even better. Going into this, I knew that I had a challenge ahead, but I was confident I was going to succeed. It all started off with my purchase of a UV flashlight. I knew that not everything glows under black lights. 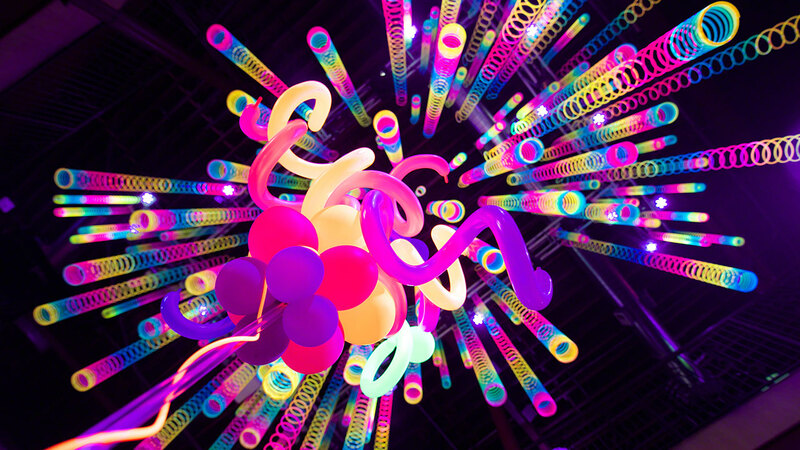 Just because it is a neon color, that does not guarantee that it will react to the UV light. I made sure my client knew this as well as I tasked her with finding all UV reactive plastic ware, plates, cups and more. The concern from the client was it would look cheap. Under normal circumstances, I would not tell a client to get plastic plates, forks and cups for an upscale event. 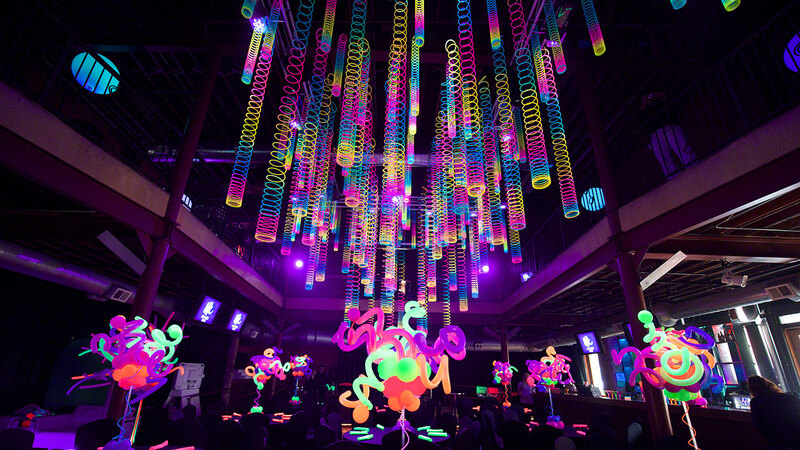 In this case, it was intentional as it added to the design of the event. My 8 year old son found it funny that I walked around with a UV flashlight in the store shining it on different items. He inquired if I always carries it around. Only when I am doing a UV party! 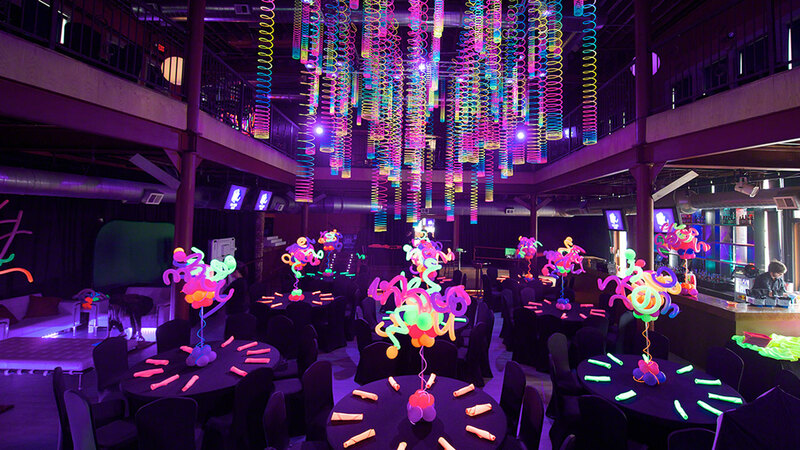 The tables and chairs were covered with black spandex and topped with neon napkins. I recommended bringing in a face painter that could paint with UV reactive product. 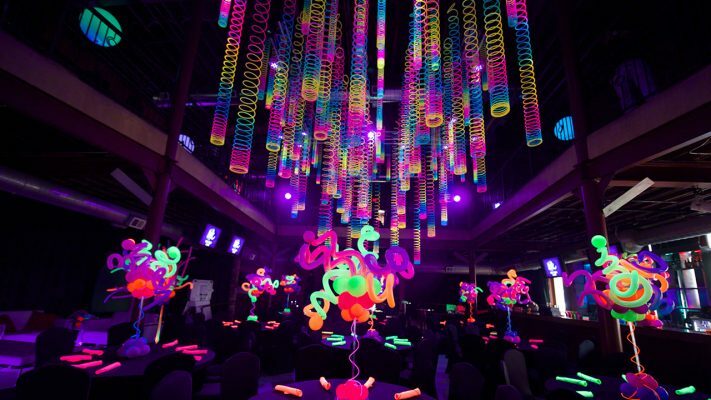 Paula also brought in a balloon company to make centerpieces that were UV reactive as well. 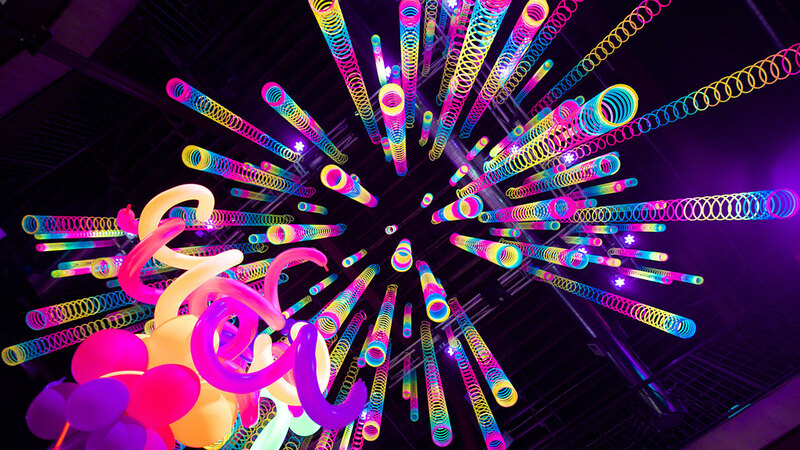 We brought in 151 slinkies to hang on the truss. This was no easy feat as each one had to be attached to a wire grid strung between the truss. 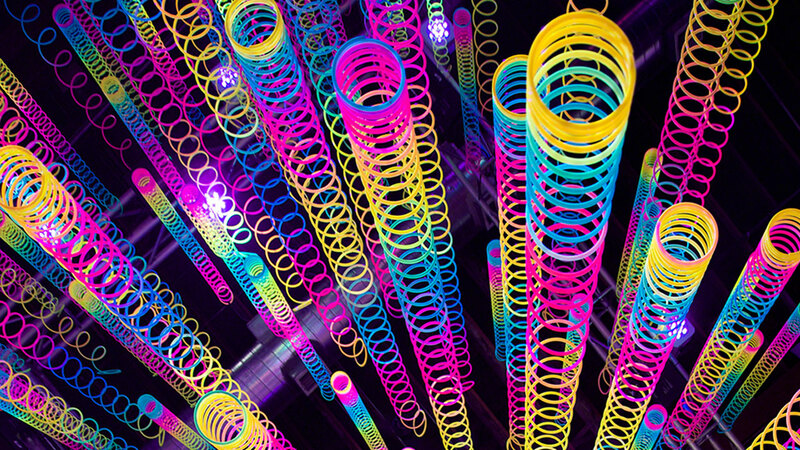 No ordinary slinky would work, we needed HUGE ones. 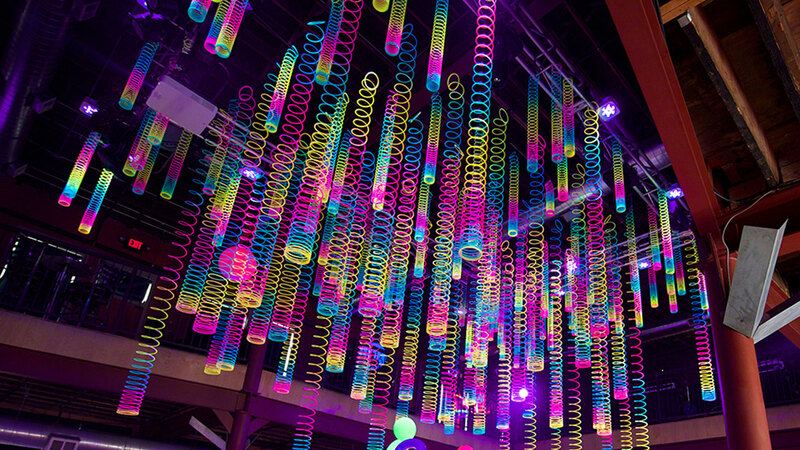 We installed 54 – 6″ slinkies and 96 – 4″ slinkies. 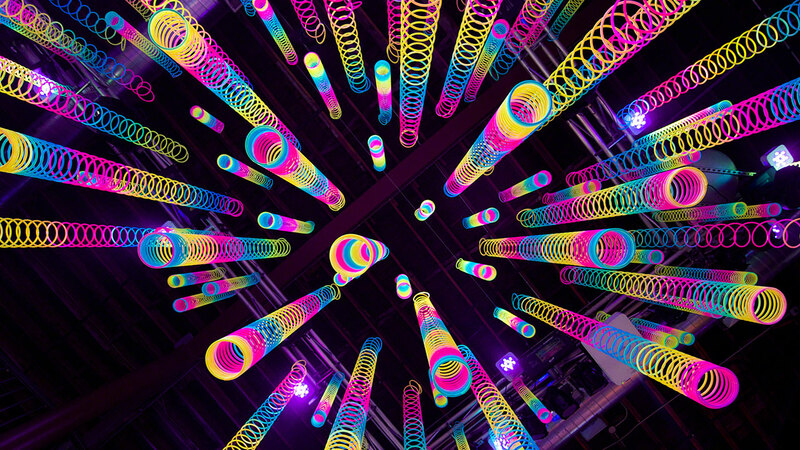 For those who are asking, a regular slinky is 3″ in diameter. Now we had to make sure that we brought in enough UV lighting to illuminate not only the slinkies, but the entire club. In order to ensure I had enough UV light, we had 4 new UV canons made for us with 54 x 3 Watt LED UV chips, making them an astounding 162 watts each. Each 3 watt chip is equivalent to a 30 watt bulb. In addition to these, we installed 61 additional LED UV fixtures and changed out 30 incandescent bulbs with CFL black lights. All of this lighting allowed us to illuminate the entire venue without using any house lights. 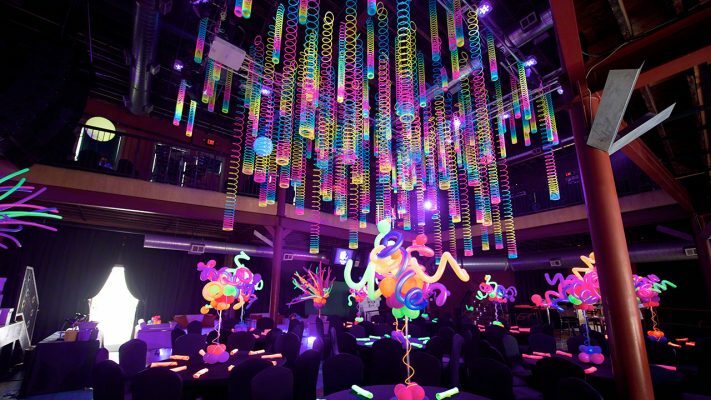 Everything glowed from cloths to plates to the decor. The entire event was awesome to say the least. All of the vendors that worked with us went above and beyond to produce the best event possible. A huge thanks goes out to everyone below. Chiavari Chairs – Is there a difference? Without skipping a beat, the answer is a resounding YES! Often times, we have clients asking why we charge $1.00 more for our chairs as opposed to some of our competitors. Many times, they are not comparing apples to apples. More like apples to snow cones. 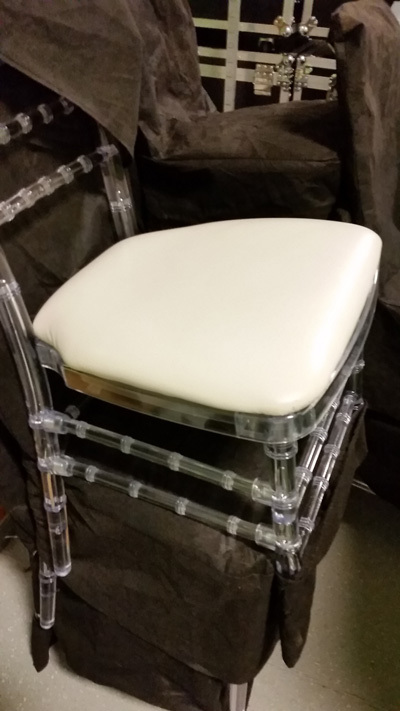 We only use Resin chiavari chairs as opposed to wood or aluminum. 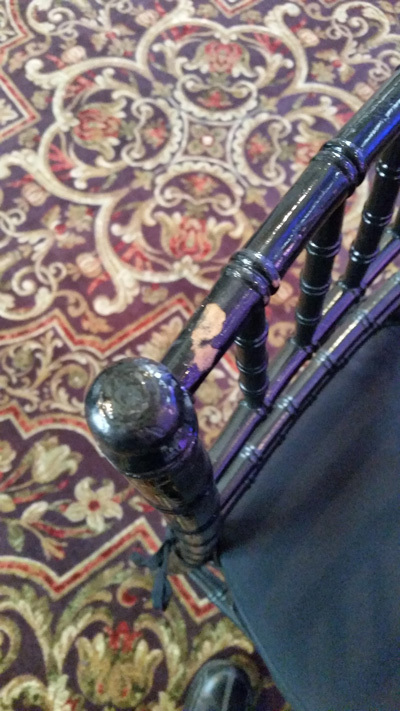 On top of that, we take meticulous care of our chairs to make sure they always look great. I am skipping aluminum as most rental companies do not rent them, but many do rent wood and the better companies use resin. Resin chairs have many benefits to them, including the ability to always look nice and shiny when properly taken care of. Resin chairs have a steel core in them, which creates a much stronger chair that does not wobble. 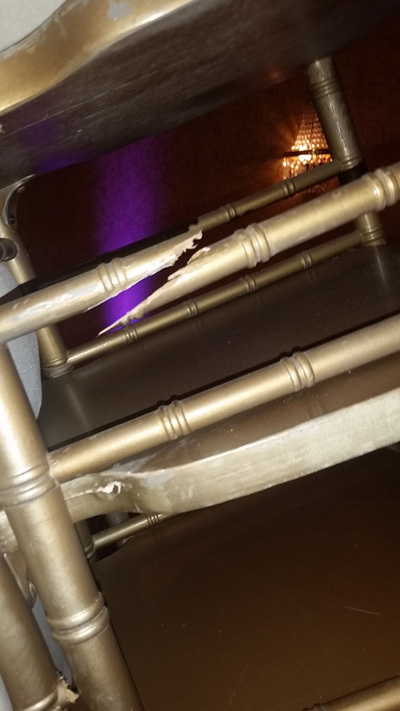 Wood chairs can break very easily and scratch just as easy. Many times, rental companies will spray paint their chairs over and over to make them look good. The problem here is the paint does not stay on long term. 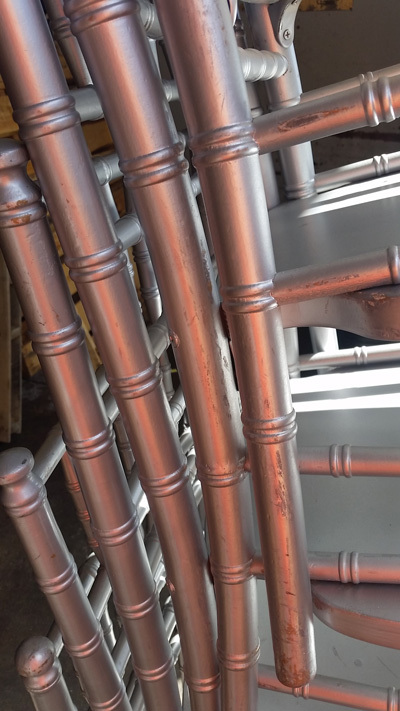 I have even seen clients get up from a chair only to have silver stripes on their back from the freshly painted chair. See the chairs stacked with the pads in place? In that dirty truck! Another thing we see often with rental companies is the lack of pride. 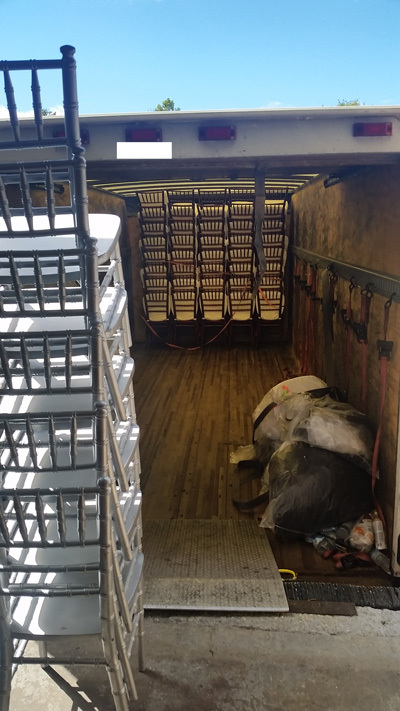 Not only do may of these companies not cover them for transport, most do not remove the pads. 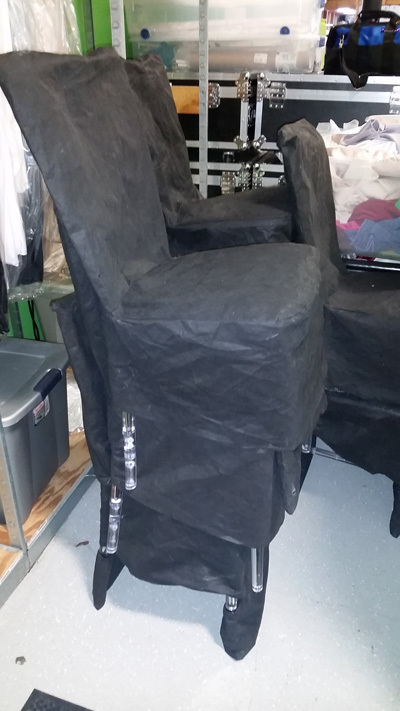 All of our chairs are transported with covers on them and the pads are put on after the chairs are set. You are guaranteed to get a great looking chair and a clean pad. You will have all the confidence in the world sitting on our chairs and not worrying about landing on the floor. Our chairs are covered for transport each and every time. Remove the cover, set a pad on it and you have an awesome clean chair. So Yes! Resin chairs are better and worth the money all day long. Why spend thousands of dollars to make your event perfect to save a couple hundred bucks on a chair that everyone will notice? Today we are so very connected with our phones and tablets. Sometimes way too connected for our own good. The rapid growth of technology over the past few years can be more beneficial to you than you may have thought. However, the same could be detrimental as well.Use social media outlets to your advantage for your event. 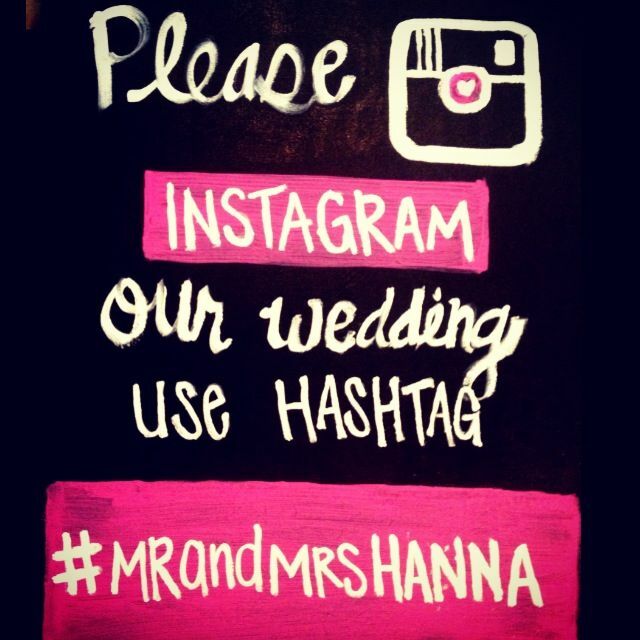 Have guests upload pictures to Instagram and hashtag your event so you can access the pictures afterwards! Twitter and Facebook use hashtags as well, so you can do the same on there! On the other hand, many clients don’t want photos prematurely released of their event, until they have received their professional photos. 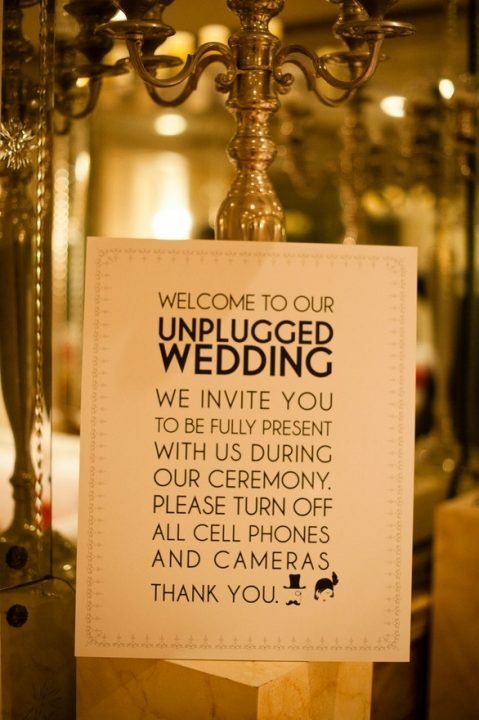 Just make it known to the attendees whether it is an unplugged or plugged in event! Also, as a guest, be sure to always be respectful of the decisions made by the event host. 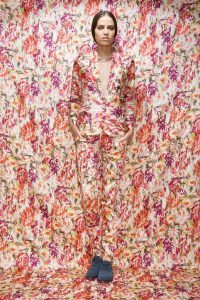 You would think the idea of matching your bridesmaids, to the tables, to the cake, and to the flowers was an idea that belonged in the 80’s. It seems that many brides are stuck on this “matchy-matchy” syndrome. 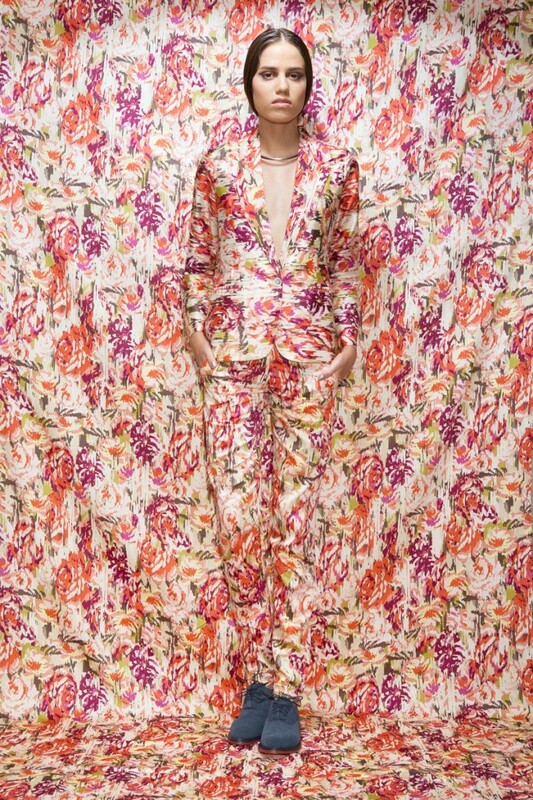 Symptoms include paranoia, fabric swatch obsession and extreme detail to hue color. 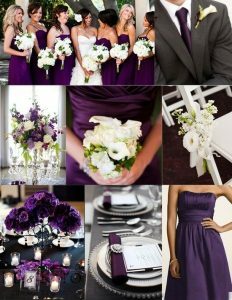 Planning an entire event around a single or two colors just seems so unoriginal. 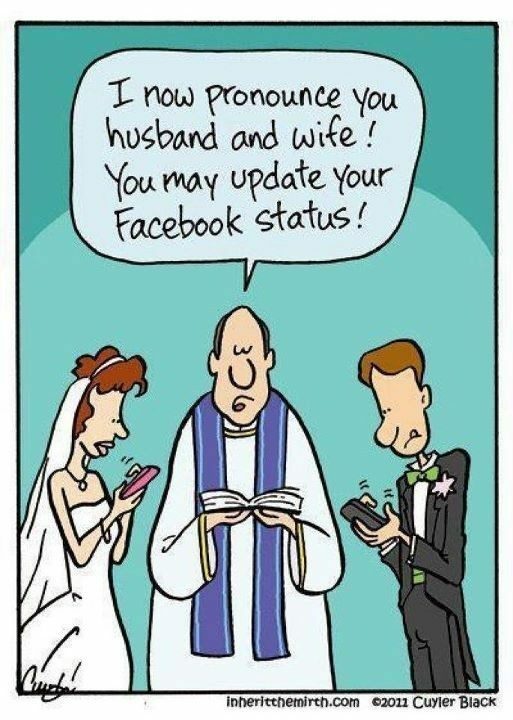 Gone are the days of unified weddings. 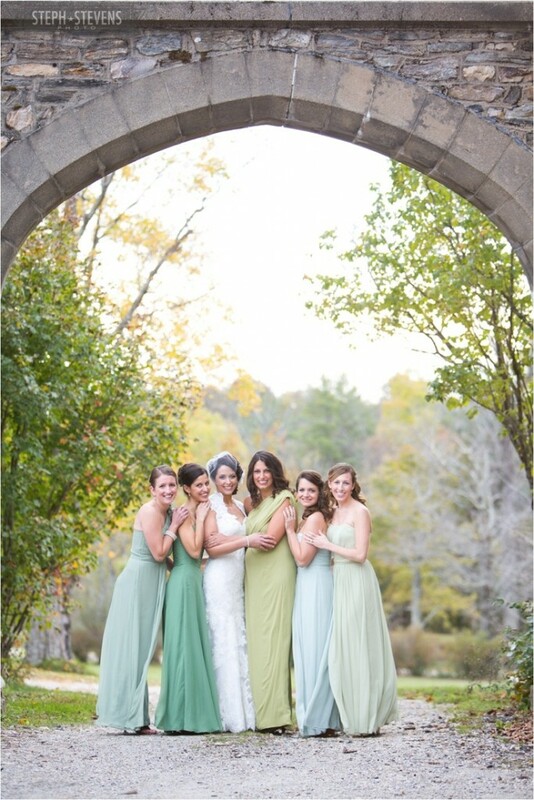 Create a color palette for your big day. Include 3-5 different colors and neutrals you would like to incorporate. This makes it a lot easier when coordinating all of your pieces. It is a heck of a lot easier to find complimentary colors rather than exact matches. 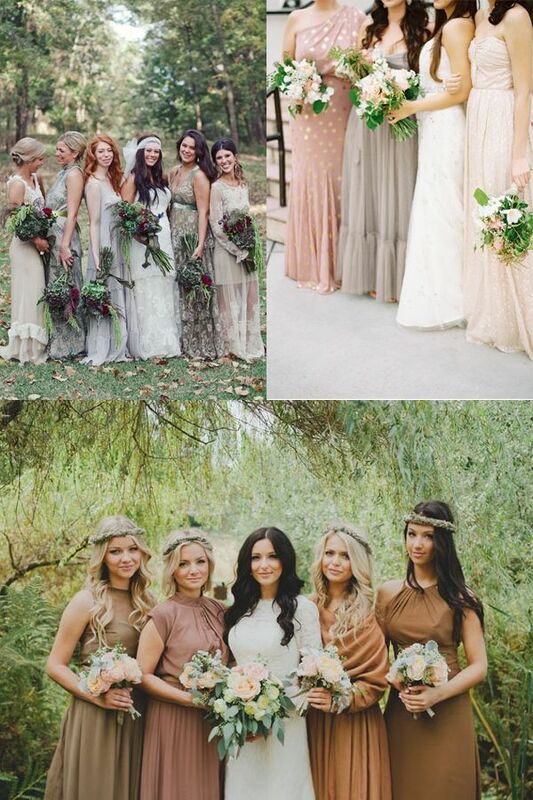 Take this idea even further and ditch the idea of matching bridesmaid dresses. Every one of those girls is different in size, shape, personality and style preference. Why not let them be fierce in a dress of their choice? Think I am crazy? Take a peek at how beautiful this philosophy can be. As always, Happy Planning from the Team at Fabulous Events! 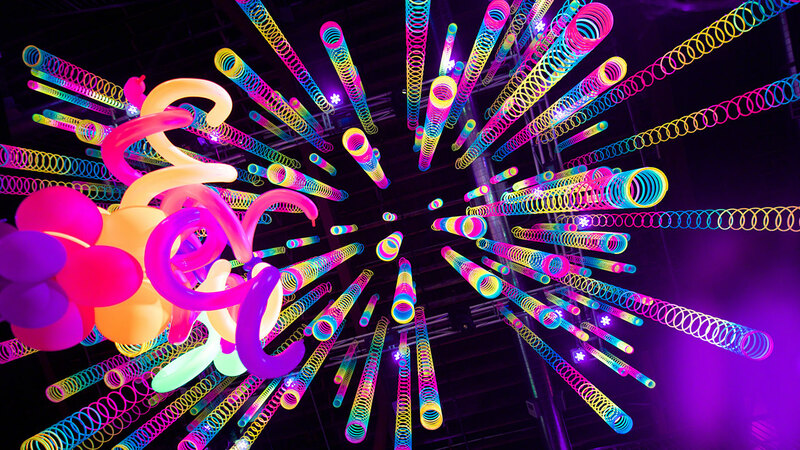 So the big question when planning your event is how much to spend. This question applies to each and every type of event. Whether you are planning a wedding, bar/bat mitzvah celebration, birthday or just a party for fun, you will ask yourself what the budget should be. Well, this is always a tough choice. Do I invite less people? Do I get 1 less appetizer or do we eliminate the chair covers and table linens? The answer could be yes or no. Obviously nobody wants to cut corners on their special day, and we understand that. There are many ways to reduce your costs and keep everything you want. Here are some ideas to consider, not all of them will apply to every situation, so filter out the irrelevant ones. Being in the event business for over 30 years, I can personally say the most important pieces of any event is food and entertainment. If you serve crummy food, people will remember your event as having crummy food. 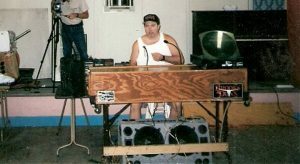 If your DJ/Band is awful, people will remember that too. 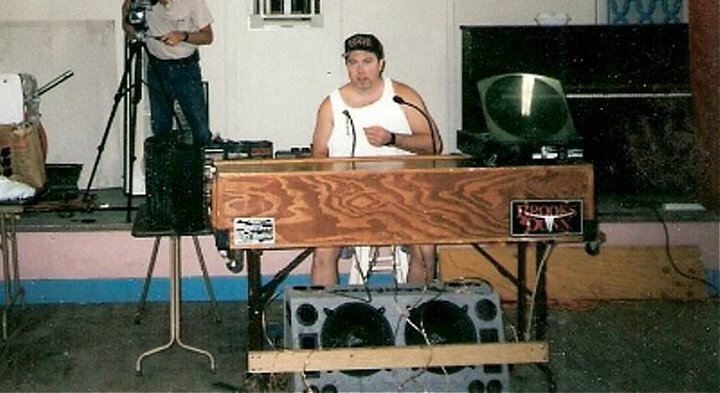 Looking back, we have all been to an event that the entertainment was lackluster at best. So make sure to taste the food and listen to the entertainment ahead of time. Do not go based on price alone, you will regret it. On the flip-side, the most expensive does not mean the best either. Word of mouth is the best advertising for any company. Oh, and make sure they dress appropriately. Decor can get out of hand sometimes, so sit back and take a look at the whole picture. Do you need to have over the top florals or centerpieces on each and every table? Maybe, maybe not. This is an area where you can trim the fat so to speak. Maybe you integrate some candles and other media into the centerpieces. Think GREEN, Eco-friendly perhaps. 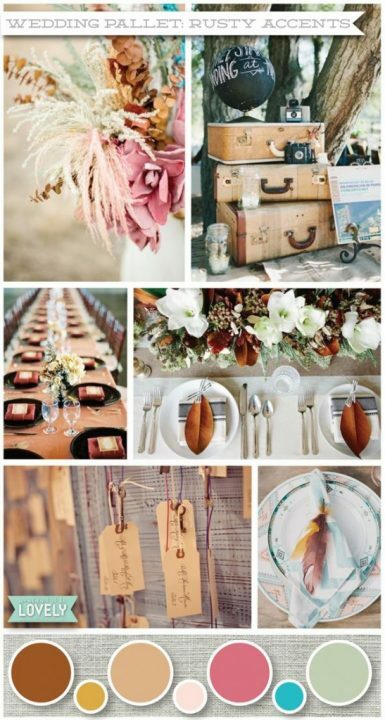 Keep in mind, at the end of the event, what will you so with all of the decor? 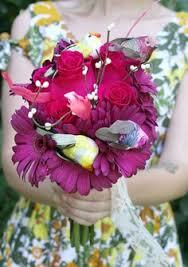 Understand, I am not saying anything negative about Florists or other Decor people. We have many great partners in the industry and they all do great work. When looking for vendors, make sure that they care about your budget and are able to design within any limitations if need be. Don’t skimp, but be realistic! Photographers and Videographers can range in pricing as well. Don’t get caught up in a situation where a friend of a friend of an uncle 3 times removed just bought a nice digital camera and is now a photographer or videographer. Chances are very high that you will not be happy with the results. Photography and Videography are both arts and as such need to be treated that way. Having a digital camera and shooting a ton of pics does not count. This is like painting a wall without a brush and throwing the paint bucket at the wall. Yes, some of the paint will stick, but much of it will be wasted. Same goes for photos and videos. Just like any other business, you can encounter highs and lows in pricing. 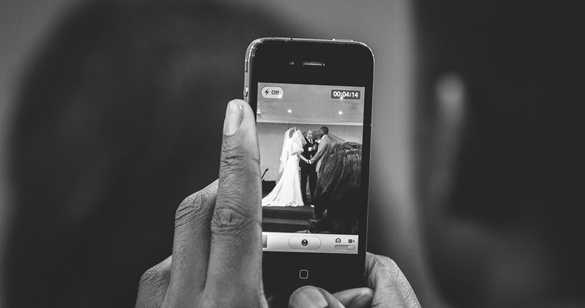 Make sure that the company you choose is showing you pictures and/or footage shot by a certain individual. You also need to like his or her personality, you are spending most of the day with them. Ok, so I waited a few paragraphs to talk about chair covers and linens. Of course, these are a must! What else would I say? Actually, these items are not typically a must have, but a like to have item. It starts with the venue you are at and what, if anything, they are offering you. Many will say that linens are included, but most will not be floor length. You also may get a choice of 5-10 colors for napkins. If you don’t care about linens and you like the look of the chairs, then you are all set. 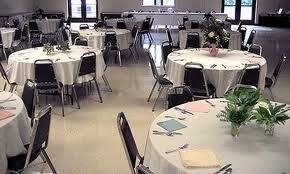 Believe it or not, adding chair covers to an event is not too expensive. This little additional expense can make a huge improvement in the overall look of your event. When we work with clients, our goal is to find the perfect chair cover, linen and napkin selection. Our pay is not affected by the client’s choice. Our goal is to give you a great look on any budget. So the shameless plug here is we have over 500,000 items in inventory, we are sure to have what you want. Planners and “Day Of” coordinators are great to have, but not always needed. If you are working 80 hours a week and don’t have time to gather up all the things you need, a planner may be the perfect choice. Planners all work on different price points, so do your research and get those referrals. Maybe you have time to run around and hire all your vendors which is great. This is a great way to spend money on other things. Maybe you just need a “Day Of” coordinator to manage the big day. This can take the stress off of you and your family. 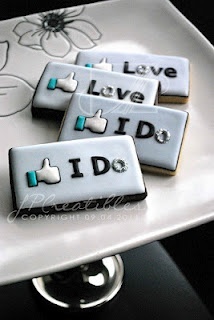 I am not going to dive into invitations, gifts for the guests, etc. This would span over pages of banter. What I can say, these areas are places you can save money on. So before you decide you want a wedding for 500 people and no budget to speak of, think about it. Is everyone on that list important to you on this day? Some choices are hard to make, but Don’t Break the Bank for your event.